Hello, crafty friends! It's Deedee here with today's Tuesday Tutorial! A. What Are Digital Stamps (aka "Digis")? Digital Stamps, also known as "digis," are computerized image files. You might think of them as stamped images that have been scanned into your computer. You store them on your computer as you would any other computer file, and can print them out to use in your papercrafting projects in place of stamped images. Because digis are computer files, you can also use them in your digital projects, such as digital scrapbooking. At Clear Dollar Stamps, our digis come in two varieties -- "outline" and "color." Outline digis are black-and-white images that you can print and color as you would any stamped image. Color digis have been pre-colored for you, so all you need to do is print them to add fun to your crafty creations. All of our digi sets include images in both JPG and PNG formats, at a resolution of 300 dots-per-inch. JPG images have a solid white background. PNG images have a transparent background. "300 dots-per-inch" means that, assuming your printer is working correctly, the images will print clearly every time. B. How Do Digis Compare to Stamps? Low Price -- Digis cost less than stamps, so you can get more of them for your crafting dollar. Instant Access -- Our digis are available as instant downloads, so once your payment clears, you have immediate access to your new goodies! Easy Storage -- Digis are stored directly on your computer, so you need never find a place to store them in your home. Versatility -- Digis can be resized, rotated, and flipped to meet your crafting needs. A Clear Image Every Time -- No need to stamp and restamp until you get it right! C. Is Special Computer Software Needed to Use Digis? As with all computer files, some basic software is needed to use digis. However, you most likely already have what is needed on your computer, and if you don't, there are many downloadable versions available for free on the Internet. A Zip Utility -- When you purchase our digis, you download them to your computer as "zip files." Zip files can be thought of as electronic "suitcases" into which we've packed the digis for easy transport, and you need to "unzip" each suitcase before you can use the digis inside. This process is also known as "extracting." A "zip utility" program is required to do this. Most computers, whether Mac or PC, come equipped with one of these. If you do not have a zip utility on your computer, you can download a free copy of Zipeg, which works on both Mac and PC computers, HERE. A Program That Allows You to Resize and Print Pictures -- Once you've unzipped your digis, you will want to be able to resize and print them. There are many programs that allow you to do this, but I find that Microsoft Word is one of the easiest to use. So for the purposes of this tutorial, all directions for resizing and printing the digis will apply to Word 2010. However, you could also use Works, Publisher, Photoshop, or any photo editing program. If you'd like to follow along with my directions for manipulating your digis using Word 2010, but don't currently have this program installed on your computer, you can download a free 60-day-use trial of Microsoft Office 2010 HERE (Microsoft Word is included in the Office suite of programs). D. What Kind of Printer is Required to Use Digis? You will need to have a printer if you plan to use digis in your papercrafting (versus digital crafting). For outline digis, you need only have a black-and-white printer. To print color digis and/or digital papers, you will need a color printer. Both laser and inkjet printers work for printing digis, but the differences in how they print can affect how the digis will work with various coloring mediums, so it is good to know which type you have. Laser printers work great with watercolor and other non-chemical coloring techniques. However, I recommend heat-setting the digis before using them. This is because laser printers use powdered toner (like embossing powder) to print instead of ink, and particularly when printing on cardstock, the toner may rub off as you handle the digis for crafting. Also, be careful in using Copic markers or other chemical-based mediums with laser-printed digis, as the chemicals may eat right through the toner. If you have an inkjet printer, watercolors and markers may cause the ink to smear. I recommend testing an image with your coloring medium before you start an important project, and if you find that the ink smears, try heat-setting the ink -- that will usually solve the problem. Once you've completed the purchase of a digi through the Clear Dollar Stamps online store, you will be redirected to the "Thank you for your purchase!" screen. On this screen, below your personal contact information, you will find a list of the digis available for you to download. Next to the name of each digi you purchased, you will see a red "Download Product" link. Click on this link to download your digi. If you purchased more than one, you will need to repeat this process for each digi. The digi files will download to your computer in the form of zip files. Be sure to keep track of the location on your computer to which you download them so you can find them later to use. With your mouse, right-click on the desktop and select New Folder from the pop-up menu. Rename the folder to something you'll recognize later, such as "Clear Dollar Digis." Locate the digi zip file on your computer. With your mouse, right-click on the zip file, and select either Unzip or Extract All from the pop-up menu. If/when you are prompted to choose a location in which to place the digis, select the special folder you created for your digis in the previous section. If you are not prompted to choose a location, then you will want to note the location where your digis get placed. If you like, move the digis into the "Clear Dollar Digis" folder you previously created. With your mouse, right-click on the zip file, and select Open With… from the pop-up menu. 2. A second menu will appear at the side. From this menu select Zipeg. Zipeg will extract the contents of the zip file to the location you selected, and place a new folder containing the various elements of the digi set there. Double-click on this folder to access these files. If you like, move this folder into the "Clear Dollar Digis" folder you previously created. Opening a digi for viewing is easy to do. Locate and select the digi you want to view on your computer, and then double-click on it with your mouse. The digi should automatically open with whatever "image preview" utility is installed on your computer. As previously mentioned, there are many programs that you can use to resize and print your digis. Remember, digis are just image files, so pretty much any program that allows you to manipulate and print images (pictures/photos) will work. However, some programs are easier to use than others, and I find Microsoft Word to be the easiest to use for these basic functions. Here are directions for resizing and printing your digis using Word 2010. Open a new, blank document in Word. With your mouse, click on Insert on the menu bar at the top of the Word window, and select Photo from the pull-down menu. A second menu will appear to the side. From this menu, select Picture from File. The "Choose a Picture" window will appear on-screen. In this window, navigate to the digi you wish to open, and then click on the Insert button at the bottom right corner of the window. The digi you selected will be placed on your blank Word document, and will have a blue rectangle around it. This indicates that the digi is selected and able to be edited. By default, because Word is a "word processing" program, the digi will be set to appear behind any text you might also type into this document. In order to be able to move the digi around on the document and place it where you want it, you will need to adjust this setting. If the image is not already selected in the document window (blue rectangle appearing around it), click on it with your mouse to select it. With the digi selected, locate the Wrap Text button on the toolbar above the document window. Click on this button. A pull-down menu will appear on the screen. From this menu, select Tight. The image can now be moved to wherever you wish to place it on the document. To move the image, left-click the image with your mouse and, while holding down the left mouse button, drag the image to where you want it in the document. With the image selected, locate the "Size" setting boxes at the top right on the toolbar above the document window. You will see two text boxes, indicating the "Height" and "Width" of the image. IMPORTANT: To the center right of the Height and Width boxes is a small checkbox -- the "Lock Aspect Ratio" box. Before making any changes to the Height or Width of the image, be sure that a check-mark appears in this box. This will keep the image proportional as you resize it. To change the size of the image, click inside either the Height or Width text box and, holding down the left mouse button, drag the mouse to highlight the current number. Type in the number you wish to change this measurement to, and then press the Return/Enter key on your keyboard. You need only change one number -- either Height or Width -- and the other will change proportionally. The image will instantly resize according to the new setting. I recommend that you do two more things before printing your digis. First, consider how you will be using your digis when selecting the paper on which to print them. Thinking ahead of what you want to do with the digis will help avoid wasting your paper. Second, test the paper you select with your printer to make sure it will feed properly. Most papers and cardstocks will feed through most printers just fine, but occasionally they don't. Better to know ahead of time than to encounter a problem when you're in crunch mode to meet a project deadline! Load the paper on to which you wish to print your digis into your printer's paper tray. In the Word window, click on File on the toolbar at the top left of the screen. A pull-down menu will appear on the screen. From this menu, select Print. Follow the prompts specific to your printer to complete the printing process. Once you've printed your digis, you're all set to color them up and add them to your crafty projects. (Or, if you're using color digis, just cut and go!) Please be sure to consider the information given in section D above about the differences between the types of printers in order to ensure best results when coloring. Also, I strongly recommend that once you finish coloring your digis, you seal them before applying them to your craft projects. Sealing them helps prevent smudging from handling. To seal the images, you can use a clear acrylic sealer. You can find this in spray can form in most art and craft stores. Be sure that you are completely finished coloring your digis before applying the sealant, as you won't be able to make any changes afterwards. Follow the specific directions on the can to use the sealant, and be sure to spray in a well-ventilated area away from children, pets, and open heat sources. After sealing, you'll want to let the images dry for a bit before applying them to your projects. 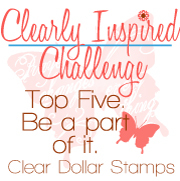 If you'd like to give digis a try before deciding to purchase some, Clear Dollar Stamps has one that you may download for free HERE. Because of how the store works, you will need to add the item to your shopping cart and check out as if making a paid purchase, but you will not be charged for this item. wow, you must have an creative idea in your mind when you draw it, right? Wow! Finally computer info I can understand. Thanks for making it easy for us dummies!! I must admit I have never heard of this but I am going to give it a try and I will be back to purchase some as soon as can use the tutorial. Many thanks for the free file so I can practice. What an AWESOME tutorial!!! I get it! I am no computer wizard by any means,,,more the silver haired granny type. But, you have a wonderful GIFT for teaching Thank you so very much for explaining this in a way even I could understand it, You rock! this has always been a stuggle for me-you did a wonderful tutorial! This is an AMAZING tutorial!!! It's detailed and so easy to follow!!! The more I know about you, Deedee, the more impressed I am with you! !